Home E: Lifestyle Don’t retire, ReFire: What sets your soul on fire? 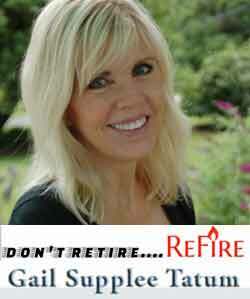 Don’t retire, ReFire: What sets your soul on fire? May 9th, 2018 · Comments Off on Don’t retire, ReFire: What sets your soul on fire? This is a question we should all ask ourselves, as soon as we open our eyes to greet the day. How many of us actually do that? How many of us know the answer to that burning question? Do we know if the answer is there, deep inside of us, bubbling up, but somehow it’s clouded by our everyday routine and obligations or is this concept, for some, a new way of thinking? How many of us have ever had a time in our lives where that answer was crystal clear, and, if so, is it still crystal clear or do we yearn to get that clarity again? May I just share from my heart that I yearn to get that clarity back. Therefore, I’m in search of rediscovering what sets my soul on fire. What I know to be true is that if you’ve been there once, you’ll want to go there again! How do we begin that discovery or rediscovery of what really sets our soul on fire? Think back on what that thing was. How old were you? How long did it last? If that fire dwindled, what changed in your life that made it dwindle? Quiet your mind to let your creative thoughts come alive. Ponder on what lights you up. If you’re having a mental block, think back through your life and pinpoint a time when you couldn’t wait to go to sleep because you couldn’t wait to wake up in the morning and do that thing which sets your soul on fire. Let that percolate. Soon something will begin to bubble to the surface. What will help you is described in the second task. Take those thoughts and put pen to paper! The more you write the better the flow and the more open your mind becomes to all of those things that have been lying dormant for however long they’ve been lying dormant. Just write. Even if what you’re writing seems silly to you, I assure you that within and through the silliness lies the fire! As you take the time and get into it, you’ll find that this is a fun thing to think about and you’ll find that your list will grow and grow. Act on it! One can write until the cows come home but until you put those thoughts into motion, you will not realize the impact that it will have on you AND those around you, whether you know them or not! You will have a magnetic energy that’s undeniable. Your posture will change so much so that you may not recognizable yourself! Your spirit will be so much lighter. You’ll see it in the way you walk, in the way you interact with people and those close to you will wonder what you’re doing! The best perk will be when you see your reflection in the mirror and it looks like you’ve had a face lift without the cost and the down time! It is a state of being that you won’t ever want to forget again. Our daily lives can often times cloud our path to aliveness. The way of moving the clouds aside and clearing your path is through the three steps above. I will add a number four to those three items and say that you and you alone hold the power within. Unlock your power. You hold the key. Once you find what sets your soul on fire, keep it burning! Don’t let it go this time!